Storms lashed the rugged terrain of Donkey Kong Island, home of the famous video game ape and his family and friends. Near Donkey Kong's tree house, a small monkey named Diddy cowered in fear of the savage lightning which periodically illuminated the lush, dark jungle that covered most of the island. Donkey Kong had assigned Diddy to guard duty on this awful night, and he was not happy about his fate. Donkey Kong's earlier pep talk kept creeping back into Diddy's mind. "Ok, little buddy," Donkey had said in his patronizing voice. "As part of your hero training, you've got to stand guard tonight over my bananas... I'll relive you at midnight, so try and stay awake until then!" Buddy? Yeah, right. Now he was alone. Alone unless you counted the unknown threats which lurked behind every tree that he glimpsed during the lightning flashes. The Kremlings were out there, this much was certain. They coveted Donkey Kong's banana stockpile, the largest on the island, and probably in the world. A treasure in potassium and Vitamin A. The perfect food. "Ahhh... delicious bananas..." The thought of DK's golden horde almost made Diddy forget his uncomfortable situation. But a rustling in the under- growth and the sound of several snapping twigs brought him out of his reverie. "W-w-who goes there?!" Diddy challenged the sounds in the darkened, dripping foliage. There was no answer but the flashing of claws and teeth, followed by a fleeting vision of many reptilian eyes and a crack of thunder. Diddy somersaulted into the fray with his signature cartwheel attack, but he was quickly overcome by the weight of many scaly assailants. The enormous bulk of Klump the Kremling landed on top of Diddy, knocking him senseless. His last memory was of a hissing voice..."It'ssss the sssmall one... Ssseal him inssside thisss barrel and tosss it into the bussshesss... Donkey Kong'sss bananasss are ourssss!" The barrel lid closed on Diddy, blotting out even the fleeting light of the storm. Seconds later, the barrel flew through the air, courtesy of Klump's army boot-assisted punt, and landed roughly in the jungle foliage. Diddy Kong knew no more. The entire Donkey Kong clan was oblivious as the Kremlings then loaded the banana horde into their Kremling karts and wheeled them off through the jungle, leaving an obvious trail of dropped fruit from their overloaded conveyances. The next morning, Donkey Kong was awakened by frantic shouting of his name. "Keep it down!!" he growled. He suddenly realized what time it was. "Morning already... I slept through my watch!" Falling out of bed and through his tree house door, Donkey Kong slid down the tree house ladder without using any of the rungs, and assumed his characteristic fighting pose, with sun-blinded, squinting eyes! One swift blow was all that was needed to leave him sprawled on the floor, face down! he groggily rolled over to see the familiar wrinkled, white-bearded, grouchy face of his old granddad "Cranky Kong" peering down at him. In his heyday, Cranky was the original Donkey Kong who battled Mario in several of his own games. "What 'cha do that for?!" Donkey Kong asked, knowing full well that Cranky was prone to cuffing him at every whim. "Take a look inside your banana cave. You're in for a big surprise!" Cranky crackled. "Diddy's gone, too!" Cranky laughed. "That's what you get for shirking your responsibility, you good-for-nothing bum! In my days we would have been happy to stand guard in the rain, 'cause that might have meant having an extra frame of animation! Of course, having rain would have been impossible, given our pitiful processing power, but..."
Donkey Kon stood there in stunned disbelief and hadn't heard most of what Cranky said. "Diddy... gone... My little buddy..." he murmured to himself. Donkey Kong was suddenly filled with conviction. "The Kremlings will pay!" he raged. "I'll hunt them down through every corner of my island, until I have every last banana from my horde back!!" "Find your little buddy and retrieve a bunch of bananas?!" Cranky snorted. "What kind of game idea is that?! Where's the screaming damsel in distress?!" "Diddy's obsession with being like me has gone too far! He may be a long way from being a true video game hero, but he had the guts, the reflexes, the heart..."
"If you ask me, neither of you are ready for prime time," Cranky interrupted. "You'll never be as popular a character as I was! Why, in my heyday, kids lined up to play my games! The quarters were stacked on the machine as they waited for their turn! If you go on this ridiculous adventure, you'll be lucky to sell ten copies!" Donkey Kong fumed. He usually let Cranky's rambling roll off his back, but this time was different. "What do you know about adventure, you flea-bitten old ape?" yelled Donkey Kong, edging closer and closer, braving Cranky's cane, until he was totally in his face. "I'm sick of hearing about your boring, single screen adventures! Diddy's in trouble, my banana horde is gone, and I'm going to get them all back!" Donkey Kong stormed off in search of his missing buddy, following the trail of bananas the Kremlings had dropped. "Well, it's not exactly rescuing a Princess, but it'll do in a pinch," Cranky snorted as DK disappeared into the lush jungle. After a moment's hesitation, Cranky followed him. "The lad may just need my help..." he mumbled to himself. "Kids today... they just don't have any respect for their elders..."
--From the SNES Donkey Kong Country instruction manual. Play Donkey Kong Country Now! Uh oh! The evil King K. Rool has stolen all the bananas from the Kong's Banana horde! It's up to DK and Diddy to get them back. 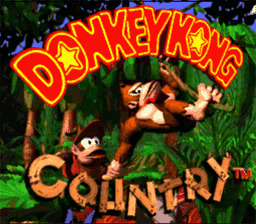 Donkey Kong Country was the start of a long and illustrious series for Nintendo. This series grew to be one of the most popular Donkey Kong games. The graphics looked really good on the SNES. The music was a pleasure as well. If you like Donkey Kong, give this game a try! Donkey Kong's girth slows him down slightly, but he'll do more damage with his jump. He can also perform the Hand Slap by pressing down and B.
Diddy is faster, and can jump higher than DK, but his weight can be a disadvantage since he'll bounce off enemies in a less controlled manner. Diddy can not do the hand slap. Both DK and Diddy can roll into enemies to kill them. Select Erase game, then press Down, A,R,B,Y, Down, A,Y, then press Select. During the Intro press Down, Y, Down, Down, Y.